Okay, anybody who has been in the blog-o-verse for a little while has probably heard/witnessed this magical thing called the YA Crush Tourney hosted by the spectacular YA Sisterhood. If you don't know what it is, let me tell you that it is basically an excuse for us book lovers to fawn all over our imaginary book boyfriends and rally together to lead them to victory. Honestly, this tournament is just for fun. It's not like an "official" thing. It is just among the blogging world. Still, it is so much fun and a great way to support all the books/authors/fictional hottiez you love! Anyway, the point of this post is to inform everyone that I (Gabbi) have been selected to advocate for Noah Hutchins from Pushing the Limits by Katie McGarry. I don't even know how to express my excitement for this. I looooooooooove Noah!!! (Doesn't everyone?) And I would just like to ask for EVERYONE'S help to bring Noah the victory he deserves. Dude has been through some tough times, and I'm sure he would secretly love it if he won ;) Please help support Noah. 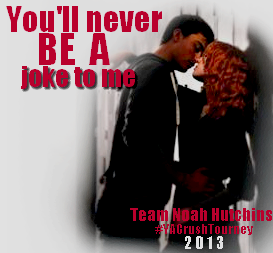 Tweet about him (using #YACrushTourney and #TeamHutchins). Post about him on facebook. Spread the word about him in every way you possibly can. Most importantly, though, please vote for him when his time comes! Also, Katie McGarry is an unbelievable writer and I am thrilled to be representing her as well! I encourage you to support ALL your favorite hotties, though. Of course, I will be voting for my other favorite book boys as well, but Noah is my main man! “Please, Noah, I don't want to do this wrong. Tell me how to make you feel good." He shifted so that his body rested beside mine, his leg and arm still draped over me. I felt small under his warmth and strength.